Who can use this Exhibition Loan Agreement? 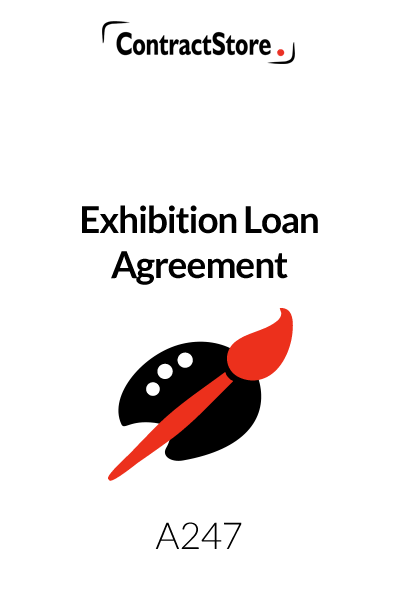 This Exhibition Loan Agreement is for use by an artist when lending a work for an exhibition. It has been developed by ContractStore in collaboration with Artquest, part of University of the Arts London. 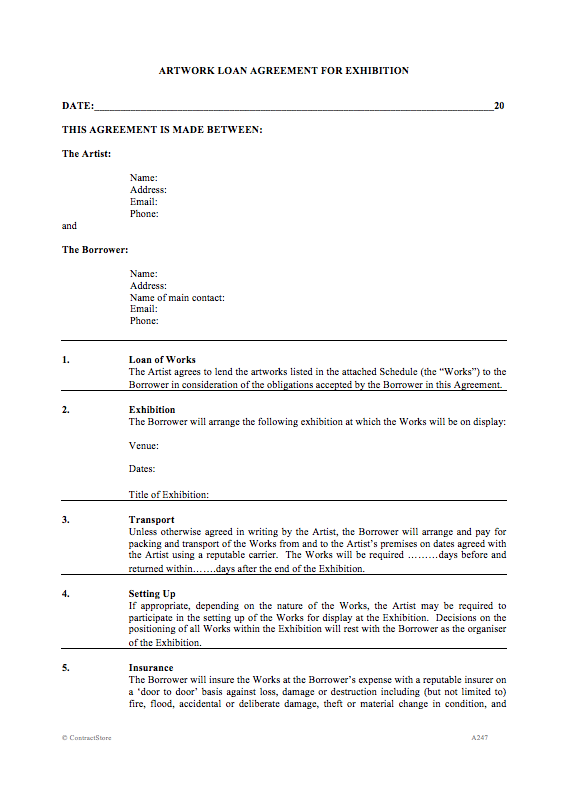 This two page Exhibition Loan Agreement is in a plain English user-friendly format and sets out the terms on which an artist will agree to lend works for an exhibition. The loan agreement will itemise the artworks to be loaned as well as the venue, dates and title of the exhibition. The borrower will be responsible for keeping the works safe during the exhibition and ensuring them against loss or damage. The artist confirms that he/she owns copyright in all the works and reserves all rights with regard to reproduction. This means the borrower may be restricted in the use of photographs except for publicising the exhibition. The agreement does not contemplate the works will be sold. 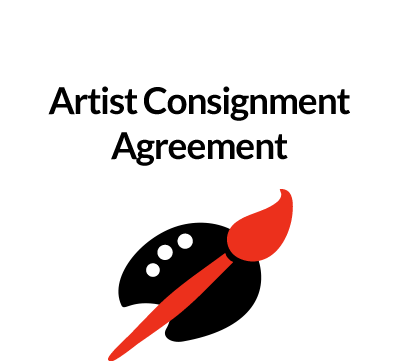 However our contract contains an clause that would enable sale enquiries to be referred to the artist, although the exhibition organiser will not get commission in our template. This agreement, developed by ContractStore with ArtQuest, is for use when an Artist is asked to lend work for an exhibition. The Borrower could be a gallery, museum or some other organisation or business. It contains two pages of Terms and a Schedule which lists the works to be exhibited and the insured value – which will be the anticipated retail value unless otherwise agreed. The Artist agrees to lend the Borrower the works that are identified in the schedule to the Agreement. This gives brief details of the exhibition including venue and dates. The agreement provides for the Borrower to be responsible for collection of the works from the artist and redelivery after the exhibition finishes. When the works need to be set up in a particular way (e.g. Tracey Emin’s bed) the Artist may be required to participate but the final decision on where works are placed within the exhibition rests with the Borrower, as organiser. The Borrower is responsible for insuring the works from collection until they are returned. The insured value of each work will be shown in the schedule and this will normally be the retail value. The Borrower is liable for any loss or damage (but should be able to cover its liability with the insurance referred to above). In the case of work that is damaged and needs restoration, the Artist is given certain rights. But if a work is damaged and cannot sensibly be restored, then the Borrower will be responsible for the insured value to be paid to the Artist. Although the main objective is not to sell the works but to include them in an exhibition, the possibility of a visitor to the exhibition wanting to buy one of the Artist’s works is referred to here. The Borrower is expected to pas on nay enquiry, but there will not be any commission for the Borrower unless the option to pay commission in the Schedule applies.